WATCH: Toronto Officer Praised For Restraint In Standoff With Suspected Van Driver : The Two-Way "Shoot me in the head," the suspect says. The officer tells him to get down. Seconds later, the man is on the ground, handcuffed. The officer did not fire any shots. 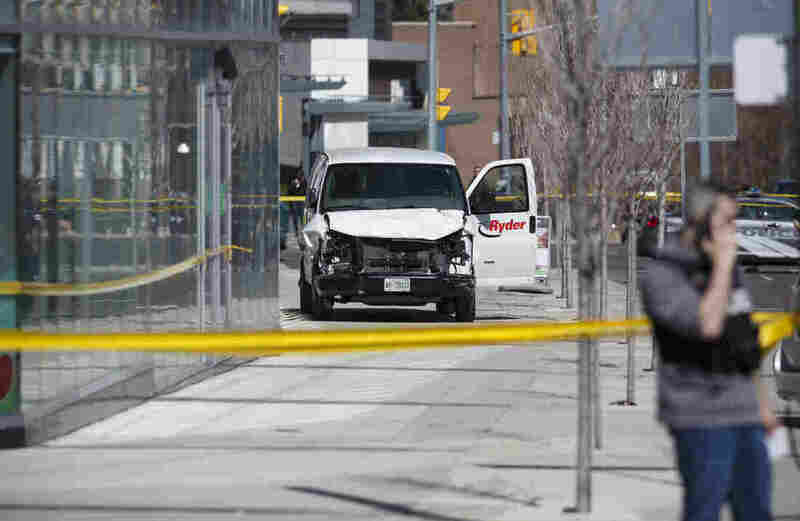 Police inspect a van used in a rampage that left at least 10 people dead Monday in Toronto. And the Toronto police officer who arrested Alek Minassian, who during a tense standoff repeatedly yelled that he wanted the officer to shoot him, is receiving wide praise for his restraint. The CBC says the officer has been identified as Constable Ken Lam. In video shot by bystanders, the suspect stands next to the battered white van and draws what looks to be a weapon (police later said he had no weapon on him, according to the Toronto Star). The officer is pointing a gun at him. "Get down!" Lam is heard saying. "Kill me!" says the suspect, claiming that he has a gun in his pocket. "I don't care, get down!" the officer replies. "Get down or you'll be shot." "Shoot me in the head," the suspect says. The officer continues to urge him to get down. Seconds later, the video shows the suspect on the ground as the officer puts him in handcuffs. Lam did not fire any shots. Mike McCormack, president of the Toronto Police Association, said he believes the officer prevented further carnage, the Star reports. "He's shaken up by the whole thing, and shaken up by the magnitude. He said, 'You know, I was just doing my job,' " McCormack said. "He's been confronted by someone who is making like he has a weapon, threatening the officer's life, trying to get the officer to shoot him, and he arrests that guy." Ralph Goodale, Canada's minister of public safety and emergency preparedness, said on Twitter that he was "grateful for the brave and professional response of @TorontoPolice and other first responders to the horrific attack at Yonge and Finch," the streets where the attack took place. Star columnist Rosie DiManno describes the officer as "remarkably composed." "All the fingerprints of suicide by cop," she writes. "But the officer didn't shoot and the suspect dropped to his knees, flinging his arms in the air." DiManno adds: "On a day of many heroes, that brave cop is at the top of the list, along with the many first responders, paramedics and hospital resources stretched to the limits." "Members of the Toronto Police Services Board passed a motion in February to issue hundreds of more conducted energy weapons (CEWs), or Tasers, to certain on-duty constables. The move is billed as a way to help the police force achieve a goal of zero deaths when it comes to interactions between the public and police. "Part of the approved motion also requires the TPS to conduct a review of other use-of-force options and gather input from the public and affected groups." The motive in Monday's van attack is unclear, although police told reporters yesterday that they believe the rampage was deliberate. Prime Minister Justin Trudeau said Tuesday that there is no evidence the incident "has a national security element," according to the CBC.